By David Theodoropoulos. Published by Avvar Books, Blythe, California. Soft cover, 6 x 9", 237+xiv pp, $32.00. "[T]he core of the book is an attack on prevailing paradigma of invasion biology.... [T]he book contains many new points of view, and stimulating ideas, and I recommend it for reading not only to specialists but also to general biologists." —Dr. J. Krekule, 2003. Book Review. Photosynthetica, 41 (3):348. "In this provocative work, Mr. Theodoropoulos uses a combination of detailed bibliographic research, precise language, and skillful polemics to analyze invasion biology as a pseudoscience... it is an organic work of great analytical force and bibliographic intensity.... The credibility of the book's arguments is based in fundamental evolutionary ecology.... Critics may dispute some of his analyses or judgments, but their own credibility would need to be measured against Mr. Theodoropoulos's analytical rigor, clarity of expression, and transparency of agenda.... Mr. Theodoropoulos' ideas are, in this book, ecologically coherent, precisely conceived, and effectively articulated." —Dr. D.L. Scarnecchia, Washington State University. Book Review, Rangelands 26(2), April 2004. 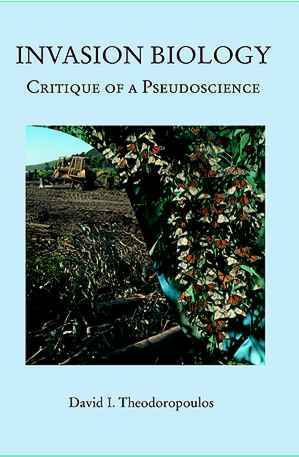 "Now it is invasion biologists' turn to face misguided invective.... [The book is] faulty... inconsistent... incendiary... disingenuous... spurious, highly politicized... invective, masquerading as an authentic scientific critique." —Dr. D. Secord, invasion biologist, University of Washington. Book Review, Ecology 85(4), April 2004. Chapter 2 The True Causes of "Invasion"